Royal Air Force (RAF) Lakenheath is a Royal Air Force station located in Lakenheath, England. 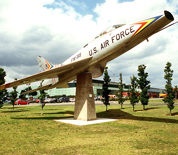 The host wing is the 48th Fighter Wing, also known as Liberty Wing. The wing maintains 3 active fighter aircraft squadrons and the 56th Rescue Squadron, and their combat search and rescue helicopters. This wing is the only one in Europe with F-15 fighter aircraft. This RAF Lakenheath directory features the critical info you’ll need to navigate through the many facilities and recreational opportunities available on base­­.